There are many ways to measure the height of a fluid and one of the most popular is to use a pressure sensor since any change in liquid height above the pressure sensor is linearly proportional to the change in pressure exerted by the head of liquid immediately above the pressure sensors position. 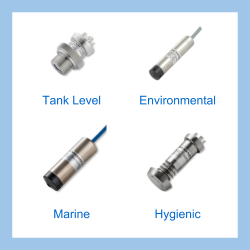 In order to measure the fluid level, a hydrostatic pressure sensor should be mounted at the lowest required measurement point, which could be an outlet or inlet for example at the bottom of the tank. However it may be necessary to create a new tapping point especially if there is a high flow rate, suction or positive pressure at the outlet or inlet for a large proportion of the time, since this will also be measured by the hydrostatic pressure sensor leading to a false reading of the liquid level. Once the height has been determined for positioning the hydrostatic pressure sensor, the required operating range will be the hydrostatic pressure exerted between the lowest and the highest possible liquid level. The highest measured level required is often the top of the tank so that overflow conditions can be detected. The hydrostatic pressure range in bar or pounds per square inch (psi) can be calculated by multiplying the liquid height in metres or feet by the specific gravity (SG) of the fluid and then multiplying this result by the converted number of bar or psi for 1 mH2O or 1 ftH2O. Please be aware that converting liquid height into pressure units is not 100% precise. This is because the pressure exerted by a liquid is influenced by changes in temperature which causes the liquid to expand and contract, thus affecting the density. Also local gravity, which varies depending on the geographical location, will cause the weight of the liquid to rise and fall. Due to these variations a number of conventions have been adopted for converting liquid height into pressure units. The easiest convention to remember is to assume a water density of 1000 kg/m³ at 4°C and acceleration due to gravity of 9.80655 m/s², which for most applications will produce an precise enough pressure conversion. 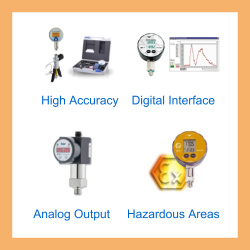 Some manufacturers offer hydrostatic pressure sensors specifically for the purpose of liquid level measurement and the pressure ranges will be in metres or feet of water gauge. Remember though, that these ranges are for water which has an SG of 1, so it is still necessary to choose a lower or higher range for fluids which have a higher or lower specific gravity than water. Measuring the hydrostatic level of a fluid which is open to the air or inside a vented tank requires the subtraction of the local atmospheric pressure. This is accomplished mechanically by venting the rear of the pressure sensing diaphragm to atmospheric pressure. 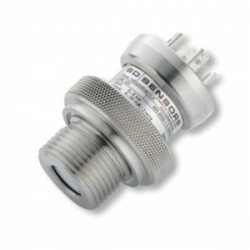 Therefore unless it is an application such as measuring sea water depth of a submersible vessel where it is impossible to vent to atmospheric pressure, the hydrostatic pressure sensor should always have a vented gauge reference. The type of reference is normally identified in the pressure range e.g. 1 bar gauge, 1 bar g or 1 bar vented gauge. 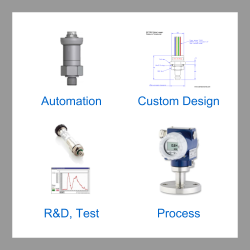 Send us your enquiry for a product associated with this Determining the hydrostatic pressure range for a tank level sensor page, and get assistance with selecting a product for your application.